Why? Read the amazing post below and find out. Or don’t. This week I travelled to Independence Missouri for a Big Read event. I’ve done many of these over the years since adapting Fahrenheit 451 into a graphic novel. The Big Read creates events around well known books for schools and libraries, thus if they choose to do events around Fahrenheit, I am often invited to be a part of it. I had a great time talking to students at the Kansas City Art Institute, and the local libraries. If you live in Independence, check out my original art work on display at several library locations. Yes, I forget which ones. Check local listings. These events are mostly uneventful, and this trip was no different other than my hotel being right next to a restaurant called Twin Peaks. The first day there I wandered over to this “Twin Peaks” to grab lunch as something in my head told me there was something in my head about Twin Peaks I should remember. Not something to remember about David Lynch or Log ladies, but something else. As I got closer, I did notice that the windows were tinted and I could not see who or what was inside. Also the front door was plastered with pictures of women in bikinis or wet t-shirts. Then I heard the roar of a motorcycle and saw that the parking lot on the other side of the building was occupied by a biker gang. 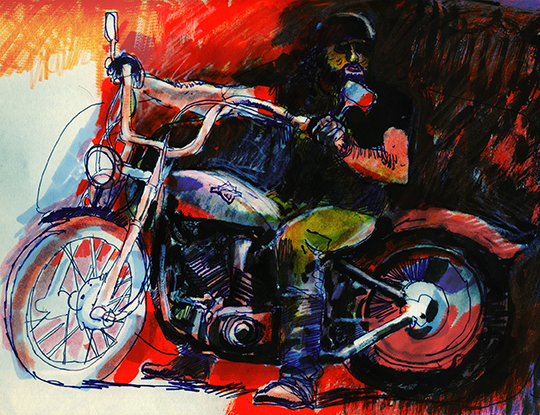 As in Harley’s and guys dressed in leather jackets with patches. Then I remembered why I knew the name Twin Peaks. Last year at a Texas Twin Peaks location, there was a motorcycle gang shoot out of some sort. Twin Peaks is basically a Hooters for bikers. Thus, I pretended not to like what was on the menu in the window (there was no menu in the window) and continued walking to the Mexican restaurant conveniently located 5 miles away. 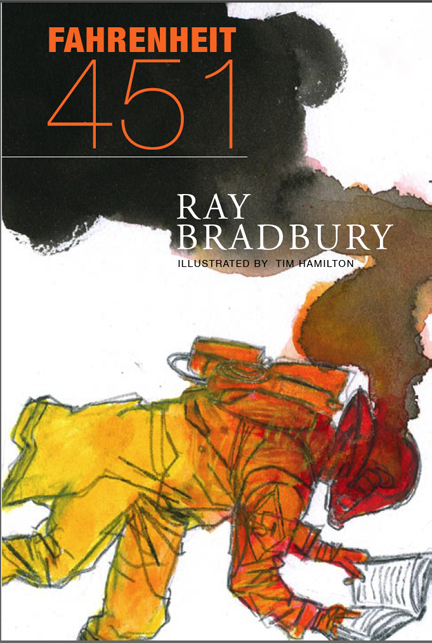 Ray Bradbury was in the news last week as he turned 91 on August 22. 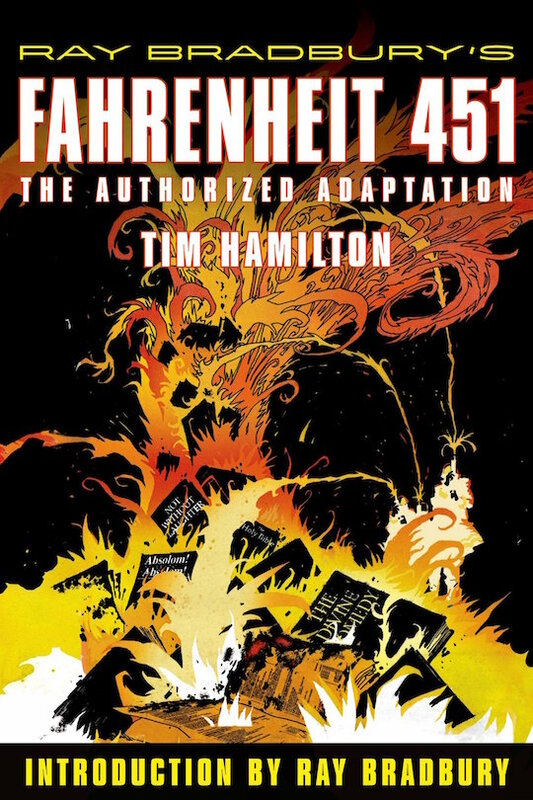 Then I see that Andrew Losowsky listed my adaptation of Fahrenheit 451 among his “Great Graphic Novel Adaptations” over at the Huffington post. Flattered and glad to know it has some staying power. 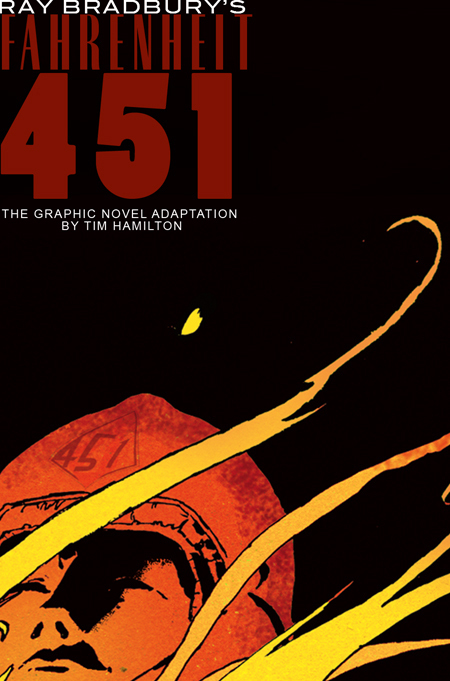 After finishing 451 I never sat down to read it again once it had been proof read for the final time. Once born, a piece of art or writing is something I want to send out into the world to live. It’ll get a job and prosper or disappear never to be seen again. Either way, I did my best with it but never want to see it again. I hardly ever look at it or write about it. 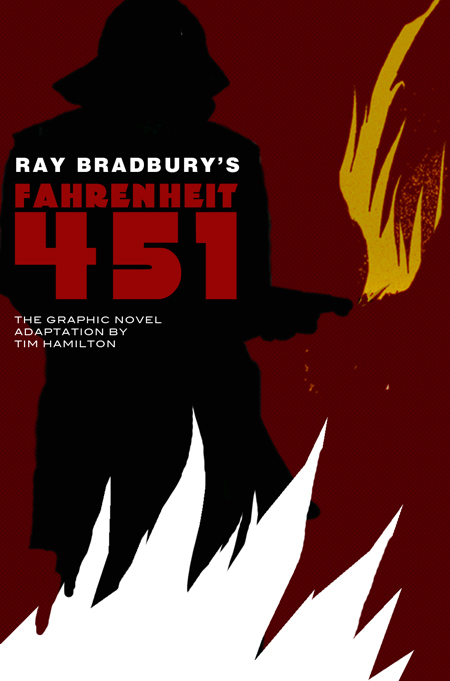 Mr. Bradbury’s birthday, and the Huffington Post, did reminded me of a few parts of the Fahrenheit Adaptation I put away and forgot about oh those many years ago. Here’s a page that was removed at the last minute. This was to be page 136. It depicted Montage floating down the river after escaping the robot dog and searching helicopters. He was thinking about how the moon was bright due to the sun I believe. By the time the publisher looked at the page count, and the front matter, it appeared that the book needed a page removed. The whole process of working on Fahrenheit was fairly drama free and this was not a huge deal. 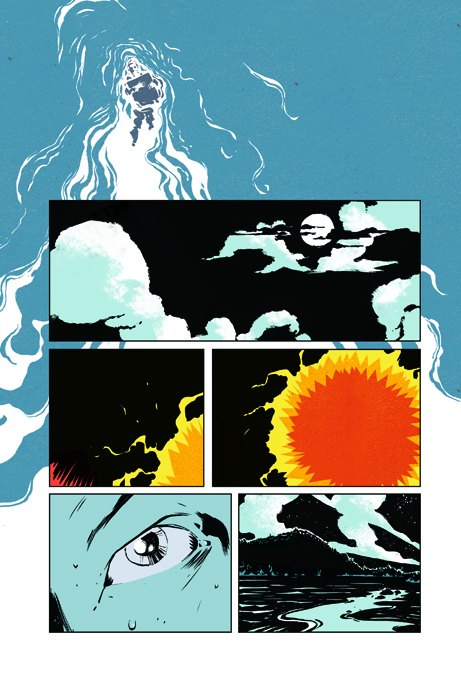 I had only started filling in the color for this page when it was removed from the book. We had a lot of cover ideas. These are three of my favorites that did not make the cut. The copy was for placement only and thus hesitated to show these for the typography alone!